Welcome to Mystic Water Soap. All of our shaving soap is made with tallow, which contributes to an exceptionally dense, slick lather. 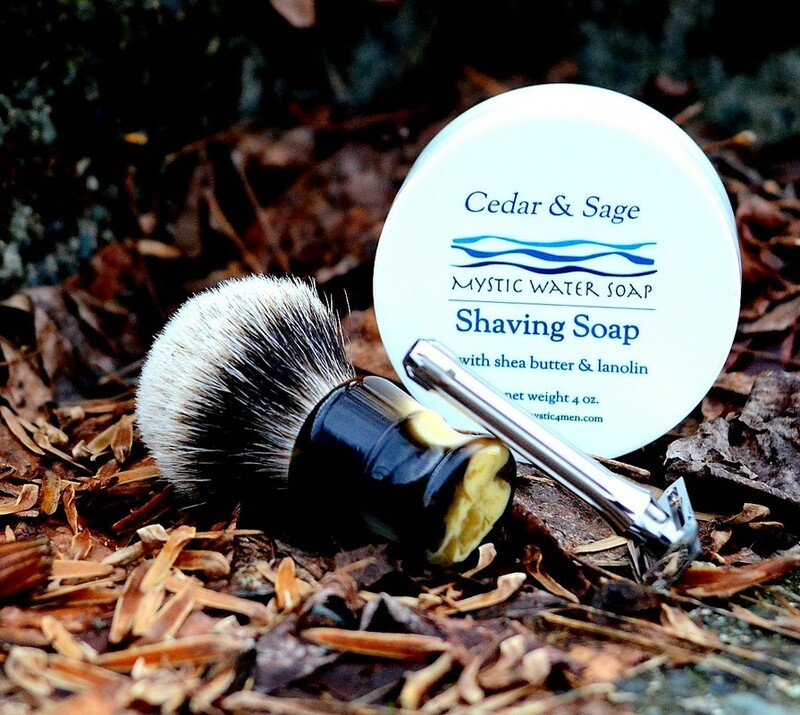 Combined with stearic acid, unrefined shea butter, sustainably sourced organic palm oil, avocado oil, aloe vera, bentonite clay, silk protein, allantoin, and extra glycerin, Mystic Water shaving soap offers exceptional protection, glide and post-shave skin care, excellent for even sensitive skin and tough beards. Most of my shaving soaps also include lanolin, and I use both botanical essential oils and high quality fragrances in my soap. See the descriptions of individual soaps below for more details. The soap is molded into 3" diameter round pucks (4 oz each), shrink wrapped and labeled with a full list of ingredients. They are sold as refills, or in a heavy-walled 4" diameter white plastic tubs with waterproof labels. The shaving soap is semi-soft, and I recommend that you press it into the tub to fill the gaps between the soap and the sides of the jar. Shave sticks are 2 ounces of soap in a 1.5" diameter plastic screw-up tube, handy for travel or face-lathering. I've included a very small amount of citric acid as a chelating agent to make lathering easier if you have hard water, and to cut down on soap scum. 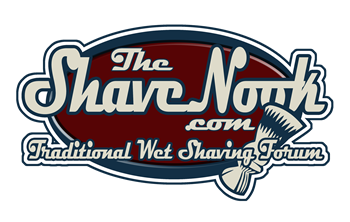 U.S. customers buying just one refill, tub of soap or shave stick can go to the Samples Page and pay reduced shipping! My shopping cart does not calculate international postage. If you order online, expect a separate invoice to arrive with the exact postage costs. 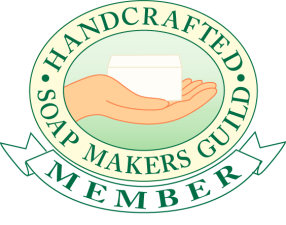 If you need help, please email me at info@mysticwatersoap.com. For more detailed information, please see my Shipping FAQ. There’s a woodsy quality to this fragrance from oakmoss and vetiver with a touch of myrrh in the base, with some sweet dried tobacco and a little tangerine and soft floral accord. It’s a masculine scent but more complex than either Marrakesh or Cedar & Sage, with less patchouli. I named it in remembrance of my grandfather John "Jack" Murphy who built a log cabin there with his sons and brother back in the 1940’s. Fragrance oil and lanolin. A different take on almond: almond with a touch of creamy vanilla, delicious. Fragrance oil with lanolin. A classic barbershop fragrance: a masculine scent of aftershave, powder and clean, well-groomed guy. Your partner will be sniffing you all day. Fragrance oil and lanolin. A classic masculine fragrance that is traditionally made with West Indian Bay leaves (Pimenta Racemosa), citrus peel and spices. This more refined version will appeal to men who don't like the clove that often predominates in bay rum blends. Fragrance oil and lanolin. An essential oil blend with bergamot citrus peel oil in the foreground, supported by woodsy Virginia cedarwood and accented with a resinous, spicy, herbaceous touch of juniper berries. These particular essential oils are especially recommended for oily skin. Essential oils and lanolin. Bergamot is a citrus oil with floral overtones, prized for perfumery and skin care. Here it is blended with lemongrass oil to accentuate the citrus, and rose geranium to complement the floral aspect. Essential oils and lanolin. A classic soap fragrance in the 19th century, it was carried by Lewis and Clarke on their western expedition and is said to have been the favorite soap of Napoleon. Brown Windsor is scented with an intriguing blend of essential oils: herbaceous and floral lavender, sweet and spicy caraway seed oil, the fruity citrus of Bergamot and petigrain, with warm notes of cinnamon leaf, cardamom and clove. This soap contains lanolin. Virginia cedarwood, Clary sage, oakmoss, patchouli, bergamot, lime and a hint of spice - this is a blend that I make for a bath soap that is popular with everyone who likes the outdoors, but especially men. Please note that Clary sage has an earthy, herbaceous scent and is not the same as culinary sage or white sage. Mostly essential oils with one fragrance oil component, and lanolin. This coconut fragrance oil smells more like fresh coconut than sweetened flaked coconut. This soap starts out creamy white but over time there is a natural color shift to light brown that does not affect scent or performance. Fragrance oil and lanolin. The emphasis here is on the lime and lemon verbena, with sweet coconut to round it out. A nice light warm weather scent. Fragrance oil and lanolin. My first "Limited Edition" that started as a collaborative effort that grew and grew...it's a nostalgic scent of fresh coconut milk and tanning oils, a walk on the beach with swaying coconut palms, white sand and gentle breezes. The scent is a little stronger than I usually venture, and is a a blend of two sandalwoods - Hawaiian and Mysore-type - and coconut fragrance, with coconut milk, shea butter, lanolin, and silk, this soap is the new chelated formula. Mahalo! Rich, aromatic coffee on a background of woody notes. Coffee, fragrance oil and lanolin. A blend of dragon's blood and myrrh resins and a touch of clove, with floral notes of rose and jasmine blending into a base of musk, patchouli, vanilla and amber. Despite the floral notes, this is not a feminine scent, but it is warm and inviting. Fragrance oil and lanolin. An herbal combination that is always pleasing, scented using pure botanical essential oils with antiseptic and anti-inflammatory properties. Essential oils and lanolin. Back by popular demand, all year round. One customer reports that when he shaves with this, his wife lets him take her out to dinner. My work is done here. ;-) Fragrance oils and lanolin. An exquisite single note scent that captures the voluptuous quality of fragrant gardenia flowers. Fragrance oils and lanolin. A really gorgeous scent combination, for those who enjoy a fruity and spicy fall/winter scent. This scent is very popular in bath soap as well. Fragrance oils and lanolin. Absinthe used to be called "The Green Fairy" and this absinthe liqueur-inspired essential oil blend of anise and herbal essential oils. If you like black licorice you'll love this one. Essential oils and lanolin. My version of Green Irish Tweed, a men's cologne blend with top notes of lemon and French verbena, green middle notes of violet leaves and iris, on a base of Mysore sandalwood and ambergris. As one of my female customers says, "It smells like a good-looking man!" Fragrance oil and lanolin. The fragrant white jasmine flower is intoxicating and women love it (and will love to smell it on you!) - if you need any other reason to try this special edition soap, it's one of the new lanolin formulations for a superlative post-shave skin feel. Fragrance oil and lanolin. I first made this soap as a favor for a good customer and it has become my own obsession to continue improving it to make it the best lavender soap that I can create. I use a generous amount of my best Bulgarian lavender essential oil, blended with French lavender and accented with lavender absolute. Essential oils and lanolin. Saddle leather and Cuban pipe tobacco, on a base of Egyptian musk and Lebanese cedar wood. This is what happens when I binge-watch old Tom Selleck cowboy movies on Netflix. With lanolin, fragrance and essential oils. Lemon verbena is a flowering shrub with lemon-scented leaves. It is used in cooking, added to herbal teas and in perfumery, and has a bright and uplifting but light lemon fragrance. Fragrance oil and lanolin. Robustly scented with lemongrass, blue gum eucalyptus and peppermint essential oils. With lanolin and added menthol. Essential oils and lanolin. A lovely scent for spring and summer, my lilac soap is made with lanolin and allantoin. This small white bell-shaped flower blooms in May and is a traditional floral scent for men. I've been told my version is very good. Fragrance oil and lanolin. The scent of citrus essential oils can fade over time, so I add a very little lemon-scented May Chang essential oil to my lime essential oil to anchor the scent. This soap is now made with lanolin for an especially rich lather. This is what fresh-squeezed limes smell like. "Maestrale" is the name of the bracing wind that brings fresh, clear weather to the island of Sardinia, where spike lavender, rosemary and peppermint grow wild - the same essential oil blend that I use for my popular Sea Salt soap. Essential oils and lanolin. "Marrakesh" is my original blend - dark iron-distilled East Indian patchouli, Virginia cedarwood, cinnamon leaf, oak moss, lime and petigrain essential oils, it's a dark smoky blend that I also use in a 20% shea butter soap of the same name. Mostly essential oils with one fragrance oil component. With lanolin. A dark brown soap made with Guinness stout and scented with a smooth beer fragrance that is blended with creamy oatmeal, orange peel, butterscotch, farm-fresh milk, almond and vanilla. It doesn't smell like actual beer but it is a warm, comforting scent. Fragrance and lanolin. Astringent and refreshing black tea scent warmed with vanilla, orange peel essential oil, and just the right amount of spice: nutmeg, clove and cinnamon leaf. A light, sweet fragrance with a clean scent that you'll want to sniff again and again. Fragrance oils and lanolin. Sweet orange and tangerine peel essential oils blended with Madagascar vanilla. The soap turns brown due to the vanilla content. Essential oil, fragrance and lanolin. This scent reminds me of hiking on the wooded hills behind my former home in Sardinia, Italy. Poggio means knoll or hill, Poggio dei Pini is literally "hill of pines". It smells of pine and cypress trees, and the dry resinous underbrush of wild plants called the "macchia mediterranea" that grow everywhere, a masculine but subtle outdoors fragrance. With lanolin and fragrance. Washington State Yakima Valley peppermint essential oil for a very pure, clean mint scent. Cold and refreshing, but not face-freezing! Menthol, essential oil, and lanolin. An American thing...pumpkin pie with just the right amount of cinnamon, nutmeg and cardamom. Fragrance and lanolin. This intriguing blend of raspberry, lemon, vetiver and leather was made for a customer because it sounded so interesting when he described the scent he imagined. Raspberry and lemon are dominant, with Haitian vetiver and leather notes in the background. A combination of essential oil and fragrance, with lanolin. A delicate, well balanced pairing of tart lemon peel essential oil and freshly cut roses. A combination of essential oil and fragrance, with lanolin. Sandalwood essential oil is used as a base note in 30% of all men's fragrances. Since real sandalwood oil is becoming rare and is very expensive, we use a blend of fragrance oils that duplicate the warm woody scent with delicately spicy undertones. With lanolin. Sandalwood and rose together, this is the fragrance known as "Earth Rose" in my 20% shea butter bath soaps. Intoxicating. Fragrance oils and lanolin. I used some of my private stash of honey from the Sardinian mountains in this delicately scented light brown soap (the color comes from the honey). Fragrance oils and lanolin. A lot of soaps claim to be good for sensitive skin, and then disappoint. Not this one. I've included a lot of good herbal ingredients in this soap including Calendula officinalis (Marigold) flower, aloe vera, sea buckthorn berry oil and allantoin. No fragrance or essential oils have been added to this soap but it has a mild pleasant natural smell of its own, from the top-quality ingredients. There is no saponified coconut oil in any of my shave soaps, which makes them especially gentle and good for sensitive skin. This soap is particularly soothing due to the botanical additions and lack of added fragrance. Lanolin free. When I was looking for a name for my new pipe tobacco scented soap, I came across a description on a tobacconist's website that perfectly described this scent : "A mild blend in every respect, the aroma upon opening the bag is sweet and…well, briary. Certainly vanilla is among the aromas..." I don't know if Sweet Briar Flake tobacco is what the blender had in mind when they made this fragrance oil, but the description seems to fit. Fragrance oil, with lanolin. Another customer special request: tea tree oil has documented antiseptic properties and this soap would be a good choice for anyone with oily or troubled skin. The scent of tea tree oil has been described as "medicinal" but in combination with the Blue Gum eucalyptus the overall effect is invigorating and fresh. Essential oils. No lanolin. Essential oil lovers will appreciate this blend of tea tree, lavandin, patchouli and lemongrass. It smells fresh and clean, with all the good skin-care qualities of tea tree oil. Essential oils and lanolin. One of my most popular scents in bath soap and shea butter is now a shaving soap. Scented with sandalwood fragrance oil and Madagascar vanilla. Fragrance oils and lanolin. Vetiver essential oil is earthy and a little smokey, often described as smelling "like a damp forest floor", but this blend has warmth and brightness, like walking through a forest and coming into a sunlit clearing. Essential oils and fragrance, with lanolin. Woodland violets, with a delicate floral scent and hint of green leaves. With lanolin. Delicate and fresh, a subtly sweet floral accord combined with white tea and a hint of fresh ginger, a very calming and relaxing fragrance. Fragrance oils and lanolin. This is an "Old Spice" type fragrance oil and, along with Bay Rum, is one of the best known of the classic masculine scents. It is comprised of top notes of orange, sage & lemon, blending into carnation, geranium, cinnamon, jasmine and heliotrope. The lingering base notes are of vanilla, cedarwood, frankincense resin, tonka bean and musk. Fragrance oil, lanolin. If you like rose scented soap, this one is pure, clean, true rose, like smelling the flower. Fragrance oil and lanolin.